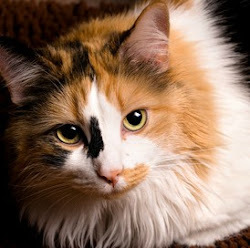 Thomasina's Purrls Of Wisdom About Cats: Do Cats Shed In The Fall? Do Cats Shed In The Fall? Do cats shed in the fall? It's September, and my cat is shedding nonstop. I thought cats shed in the summer. Do I have an abnormal cat? Yes, cats shed in the fall! In fact, cats who live strictly indoors shed all year. So your cat's perfectly normal, at least as far as shedding goes. In the fall, our human seems to spend a lot of time brushing and vacuuming, because when cats shed in the fall, we make as much of a mess as we do when we shed in the spring. Cats shed in the fall because we need to get rid of our light summer coats to make room for the dense fur that will keep us warm in cold weather. In the spring, we shed our winter coats so we'll be cool in the summer. Here's something else you might not know. It's not the changing temperature that triggers shedding, but the amount of light we're exposed to. As the days get longer in the spring, our bodies know summer's coming, and it's time to take off our winter coats. As the days get shorter and it gets dark earlier, we prepare for cold weather by adding body fat and denser fur. Indoor cats shed year 'round because they're always exposed to the same amount of light, and the temperature in their homes hardly ever changes. Their bodies are confused and don't know what season it is! Oh, and one more interesting cat fact: I don't shed more than cats with short hair do. My hair is just more noticeable on the furniture and our human's clothes because it's so long. To us, shedding is normal and just part of life. But to humans, it's apparently a big deal. 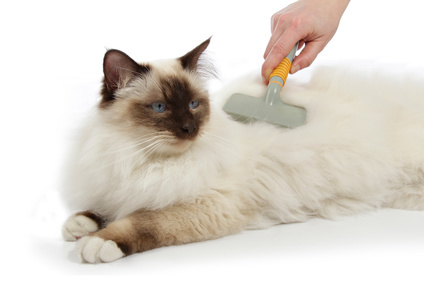 So here are some ways to minimize shedding so your cat won't get fur all over everywhere. Give your cats wet food. It will keep their skin hydrated (I have no idea what that means. My human typist just stuck it in there) so they shed less. Brush your cat often. At our house, all of us love our greyhound comb . Keep your lint brush handy because shed happens, and it's sure to land on your clothes, especially when you're wearing black! Because shedding is a cyclical process, you shouldn't worry about your cat ending up bald no matter how much hair you find all over your couch. But if he's losing hair in clumps or his skin looks irritated or scaly, you may want to take a trip to your veterinarian to make sure there's no underlying medical reason for the sudden loss.